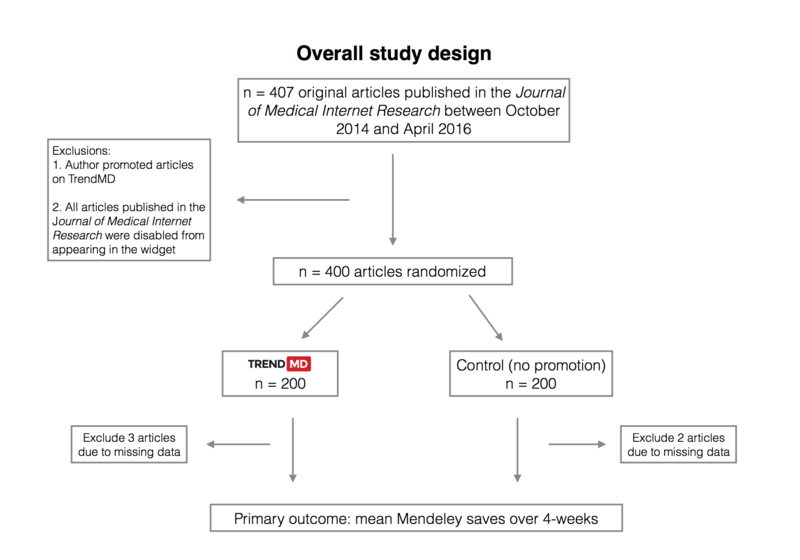 TrendMD and JMIR conducted a 4-week randomized control trial showing increased Mendeley saves for articles promoted with TrendMD. Back in 2016, we published a study showing TrendMD’s efficacy at increasing pageviews for JMIR articles (49% increase in article views for 500 articles given a $250 budget). Of course, one of the main goals of increasing article visibility is to increase the citations for that article. Multiple studies have shown that the best predictor of citations is article saves of articles on reference managers [e.g. 1,2,3,4], so our next step was to show that the increased pageviews TrendMD drives correlates to increased article usage on these reference managers. In October, TrendMD and The Journal of Medical Internet Research (JMIR) conducted a follow-up study to determine how promoting an article using TrendMD affects article saves in Mendeley. We took 400 articles published between October 1, 2014 and April 30, 2016 and randomly assigned them to the TrendMD promotion group or a control group. Before starting our study, the two groups of articles were indistinguishable both in their number of pageviews and their number of saves on Mendeley. 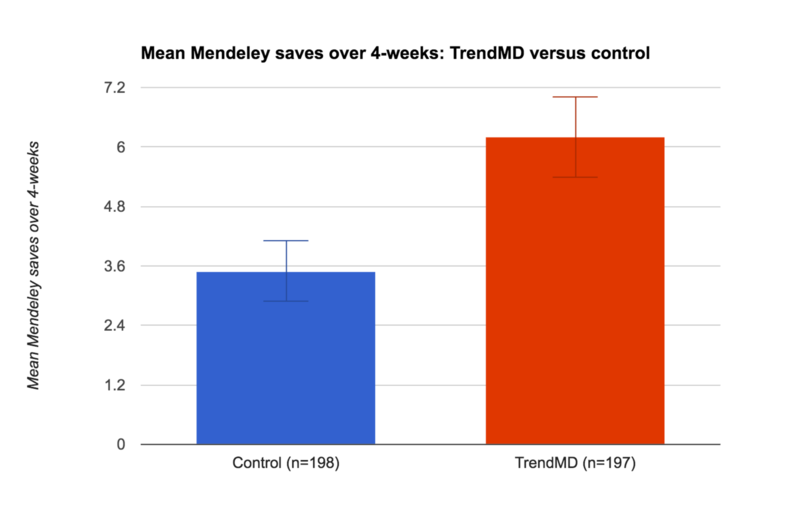 After 4 weeks, articles in the TrendMD promotion group had a 77% increase in mean Mendeley saves (6.2 saves compared to 3.5). TrendMD has already been shown to increase article pageviews; this study shows TrendMD also increases article usage, as measured by saves in Mendeley. Taken together, these indicate TrendMD is a powerful discovery tool that may lead to increased article citations. Stay tuned for posts highlighting various aspects of our study over the next month. You can also check out the full study here. Priem, J., Piwowar, H. A., & Hemminger, B. M. (2012). Altmetrics in the wild: Using social media to explore scholarly impact. arXiv preprint. Zahedi, Z., Costas, R., & Wouters, P. (2015). Do Mendeley readership counts help to filter highly cited WoS publications better than average citation impact of journals (JCS)? arXiv:1507.02093. Maflahi, N., & Thelwall, M. (2016). When are readership counts as useful as citation counts? Scopus versus Mendeley for LIS journals. Journal of the Association for Information Science and Technology, 67, 191–199. doi:10.1002/asi.23369. Thelwall, M., & Wilson, P. (2016). Mendeley readership altmetrics for medical articles: An analysis of 45 fields. Journal of the Association for Information Science and Technology, 67, 1962–1972. doi:10.1002/asi.23501.